Hailing from Montreal, Canada, BOOKAKEE is a progressive technical death metal band formed in 2007 by Simon Pierre Gagnon and Jonathan David. Drawing influence from bands like OPETH, DEATH, and ORIGIN, the group first cut their teeth in 2009, winning a battle of the bands called "Metal Academie." The band then saw a rebirth in 2011 with the acquisition of Philippe Langelier and Matt Pare. Philippe, a former Canadian Idol participant and accomplished visual artist began providing artwork, full body makeup and props for the live act, often likened to that of GWAR's. In 2013, the band went on to record, mix and master their first full length at Simon Pierre's house, a 13 track album titled "Whorrific." The quintets followup was mixed and mastered at the legendary studio of Christian Donaldson (CRYPTOPSY), The Grid. Drums were also recorded here, while the rest of the recording was once again done at Simon Pierre's home studio. 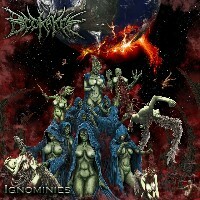 "Ignominies" is an all out assault, "Monarch of the Depraved" instantly showing off the technical prowess of the guitarist, the fast past sweep picking calling to mind ORIGIN. The five piece are as crafty with brutality as they are with melody, the crushing grooves punctuated with beautiful passages. Not much time to breathe, as the title track lays out a violent beatdown, and some truly sinister synth that couples well with the dissonant guitars and pig squealed vocals. "Oculus Nebula" begins with a creepy, hypnotic piano tune, layered with various droney synth that crossfades with the impending doom to come. It cannot be overstated just how versatile Philippe is vocally, his chaotic unpredictability match the overall tone Bookakee seems to be going for. "Mario Whirl" is a tribute to various songs from the Super Nintendo game Super Mario World, no doubt a crowd pleaser and it is put together very well. "Refuge Insidieux" tones things down considerably with heavy synth and what sounds like a classical guitar. "Celestial Decimation" is a 12 minute epic that starts off sounding like a typical melodic death metal song but quickly gets down to business with some serious grooves, breakdowns, blast beats, frenzied guitar solos and layered guitar tracks. "As We Assault Empyrean" continues the onslaught with more slamming grooves and power blasts, never once shying away from a guitar solo as the album fades into oblivion on "Noise," a song that is exactly what the title suggests, a series of samples, notably from Fight Club, SAW and Mega Man. BOOKAKEE is a total powerhouse of brutality and I would recommend them to fans of ORIGIN and BRAIN DRILL. Their live performance is a sight to see, and definitely adds something fresh to the scene.